Today’s restaurant menus read like grocery lists. Descriptions, even prepositions, are edited out. Steak isn’t “served with.” Peppers aren’t piled “on top of.” It’s this elemental style, which makes restaurant food seem sparse, unfussy, even when it’s not. 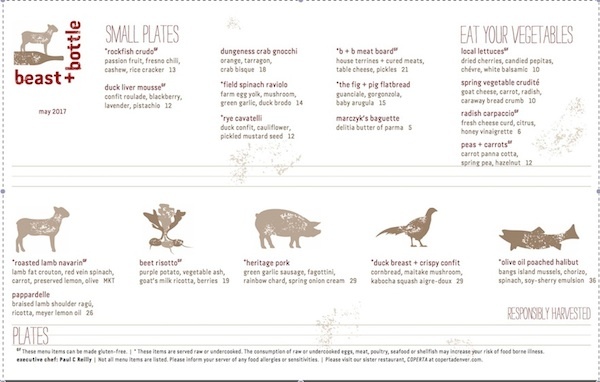 In clipped phrases, chefs can be coy, even subversive: Are we to think “mushroom, toast, arugula” is a sandwich or salad? With fewer details, we’re reminded that ingredients—and the chefs that play with them–hold all the cards. For the most part, diners like menus like this. In fact, they have been trained to anticipate more in a dish the less chefs say about it. As long as they like the ingredients listed on the menu, they are willing to trust that the chef will make them taste good together, that they’ll have something worth paying for to eat. This leads me to wonder: If a list of ingredients is all it takes for a home cook to chance a restaurant meal, are ingredients alone enough to start her cooking at home? Asked differently: if she doesn’t need a detailed menu to order something to eat, does she require a recipe in order to cook? More than inspire, can restaurant menus instruct? You can trust the chef to put together something good, you argue, but not the less experienced home cook. But that misses the point. While she might not DO to her ingredients what a chef does — smoke mushrooms, gel garlic juices — she could learn from the professional approach. Rather than plug ingredients into a recipe, she could interact with them, individually, intentionally. Meals at home, like those in a restaurant, will always be hers to write.